Roughly nine months after announcing a list of 104 candidates for Emoji 12.0, the Unicode Consortium has revealed its 59 final selections, which will release March 5th. As with its predecessors, the main focus for this update is broadening the diversity of emoji. 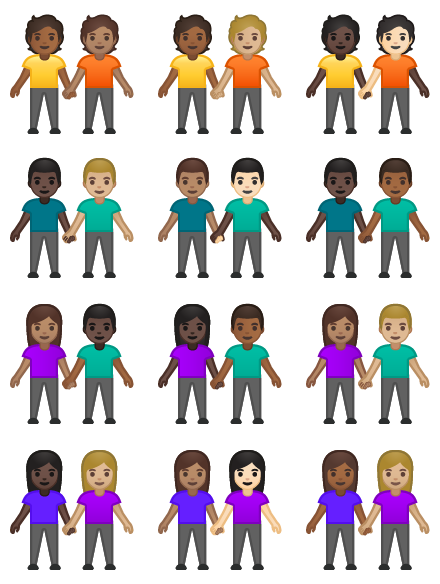 New options include a guide dog, a hindu temple, and an emoji of two people holding hands that features 171 gender and skin tone variants. One of the most notable diversity pushes with this set of emoji is inclusivity of those who are physically disabled. The 2019 set includes a deaf person signing, a mechanical (or prosthetic) arm, and a person in a wheelchair. There's also a touch more religious diversity, as mentioned above, with both a hindu temple and diya lamp emoji. Naturally, there are also a few new cute animals (flamingo, otter etc.) and delicious foods, including not only falafel, but also waffle and oyster emoji. 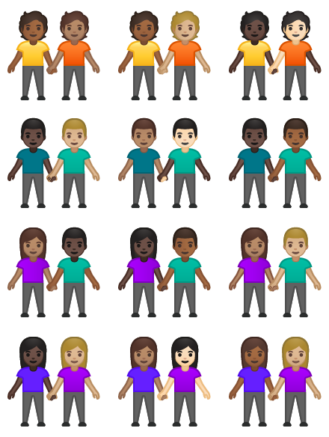 Though there are only 59 types of emoji in 12.0 (down from 66 in 11.0), if you count all gender and skin tone variants there are 230 total individual emoji in the release. Below, see a video run-through of the new emoji (in the iOS style) put together by Emojipedia, a voting member of the Unicode Consortium and the largest emoji reference website. While today marks the approval of the new emoji by the Unicode Consortium, it'll be some time before these images make it to your phone's keyboard. Manufacturers and messaging platforms are now able to begin work on their versions of these emojis ahead of the official March release, but some companies (ahem, Samsung) are known for slow emoji rollouts. Ultimately, Unicode expects the new emoji to start showing up on mobile phones in September or October this year. The full list of Emoji 12.0 selections is available to view in detail here. Unicode v12.0 has passed muster, and is now "available" from the Unicode Consortium, though it may be a bit longer until the new emoji like flamingo and waffle show up on your Android phone. Notably, Emojipedia says that Twitter will be rolling out its own support as part of Twemoji 12.0 this month. In addition to 61 new emoji (somehow two more were picked up before release, though neither the Unicode Consortium nor Emojipedia can say what they are) Unicode v12.0 also supports 554 new characters in new languages like Elymaic and Nandinagari, plus more support for existing Mao and Yi dialects, and Hiragana and Katakana small letters, and historic symbols for Tamil, among a much longer list. There are even Egyptian Hieroglyph format controls for quadrats. Google was very quick to add Emoji v11.0 to Android Pie betas last year, so I would bet that v12.0 lands in Android Q developer previews whenever they start to show up.